Bonkers with overdraw and the on-gain bonus is arguably too good relative to Acting Troupe. 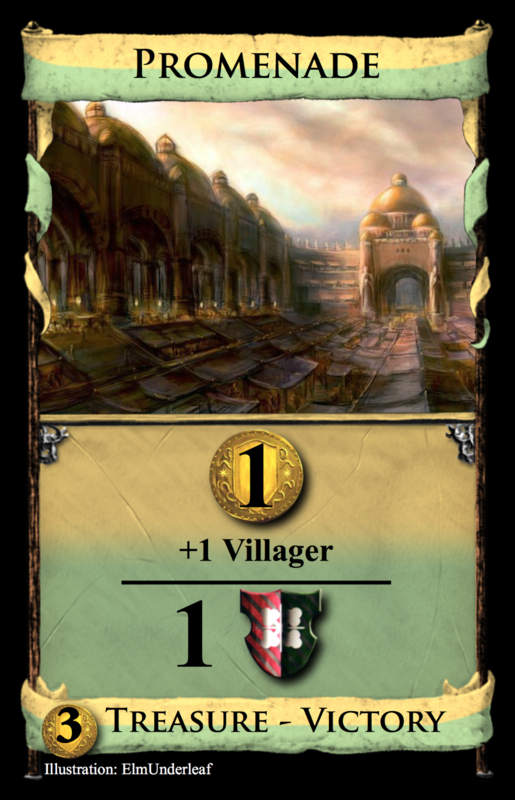 Note that the first 3 Villagers are free, assuming you can't produce more. 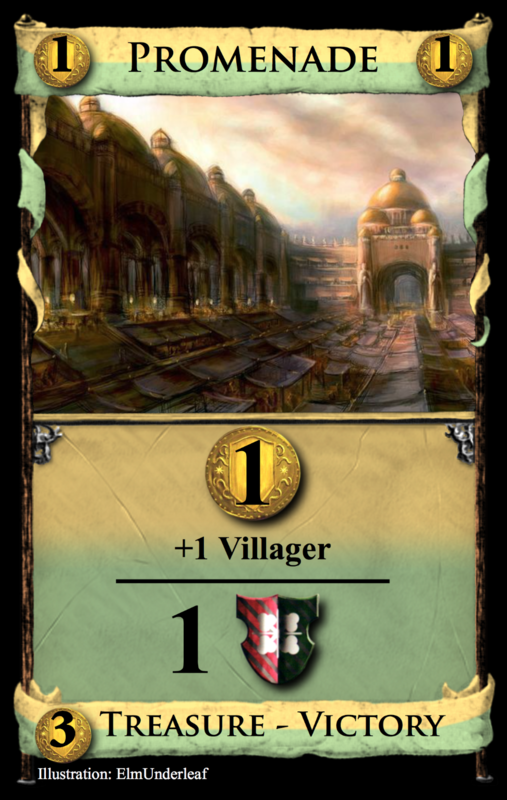 This is extremly Kingdom-dependent: nice with Villager-yielding Renaissance cards, otherwise strictly worse than Tunnel. You're right about the overdraw. I've changed it so you can't react more than once per turn. About the on-gain, I'm not sure. Keep in mind it's more expensive, and it's a dead card that doesn't trash itself. EDIT: Was missing coin symbols in upper corners. This would be nice with Scout. This + Ironworks = bad times. This is innovative, simple and plain brilliant. There could be balance issues with the price (how often are Duchies really empty?) and, as faust has pointed out, gainers, but I'd nonetheless first try this at $4. The concept is indeed interesting, just not sure it is balancable. A potential minor issue is that you can exchange those for themselves, allowing indefinite stalling. Lets assume A and B both have one Construction Site, and the Castles up to Grand Castle as well as the Provinces are gone. 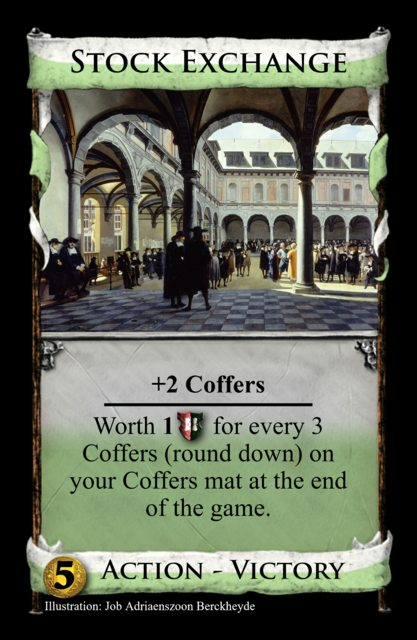 It is easy to imagine a situation where neither player would want to get Grand Castle when their opponent can get King's Castle afterwards, but taking something else will free the opponent to get the Castle and win. The best move is to keeping exchanging them for themselves until everyone starves to death. Of course this is avoidable by disallowing this exchange. A bigger problem are Colony games. Here, since at most one of Provinces/Colonies is going to run out usually, these are worth 6 VP at least. The are also some probably resolvable timing issues. 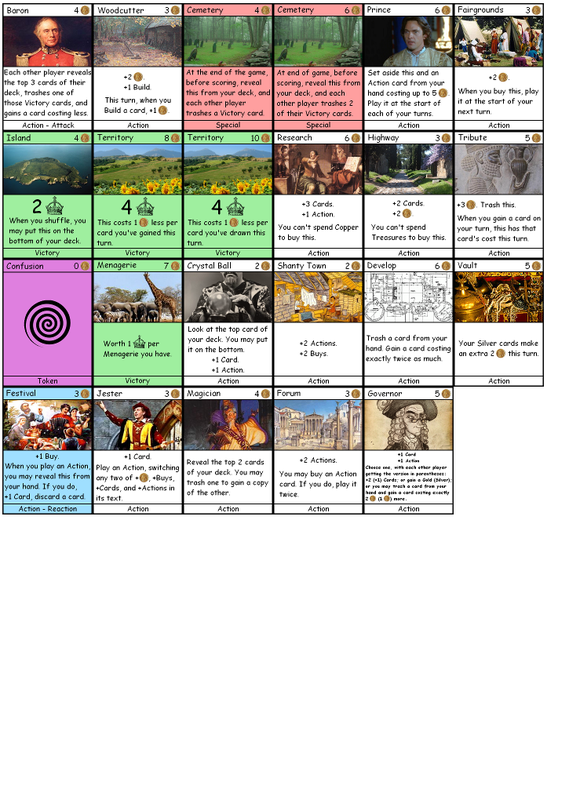 When is "at the end of the game"? 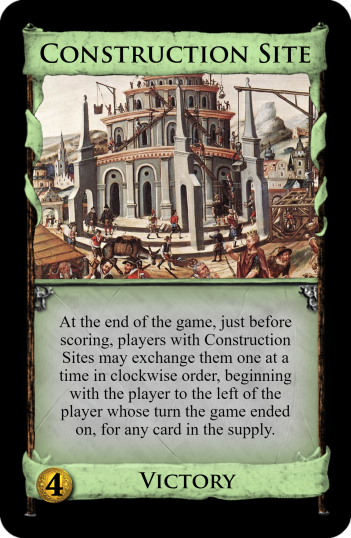 By Donate/Mountain Pass ruling, the end of the game happens when it's still a player's turn, so theoretically this means that Construction Site is affected by Possession. Also Fleet turns happen "after the game ends", adding further confusion. Is this really a Victory card? Discard up to two cards. 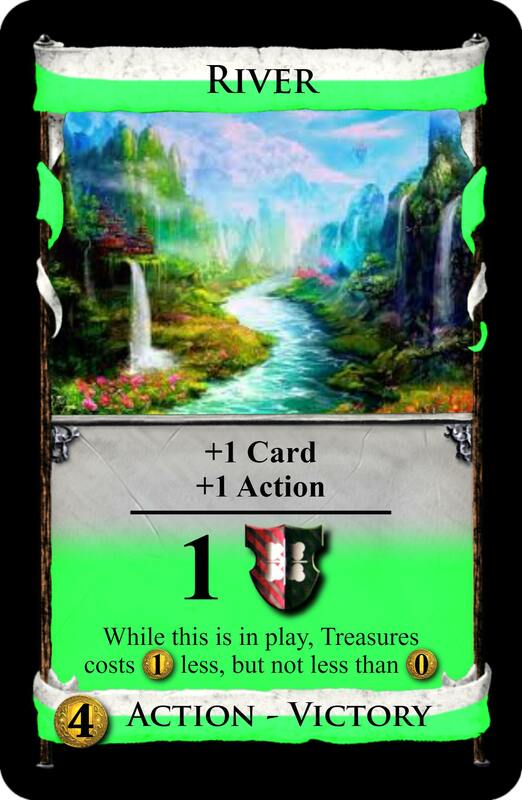 Gain a silver for each card discarded. Yeah, I guess I'll change it back to my original idea which was the same except you always discard one card for one silver (not flexible). I'll edit my OP. 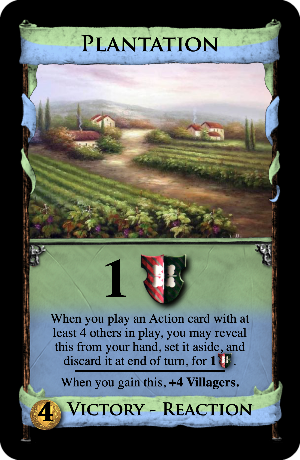 A few times over the years, I tried to make a card that cost the other players a victory card at the end of the game. It attacks your score. This version I'm looking at was an "Action - Endgame." Cemetery I tried multiple times, since it was novel, a different way to attack the other players. It was always too little or too much. It's a bit of a stretch, yes, but its sole purpose is affecting your score and you only care about its text during (the very start of) scoring, so I think it's close enough. 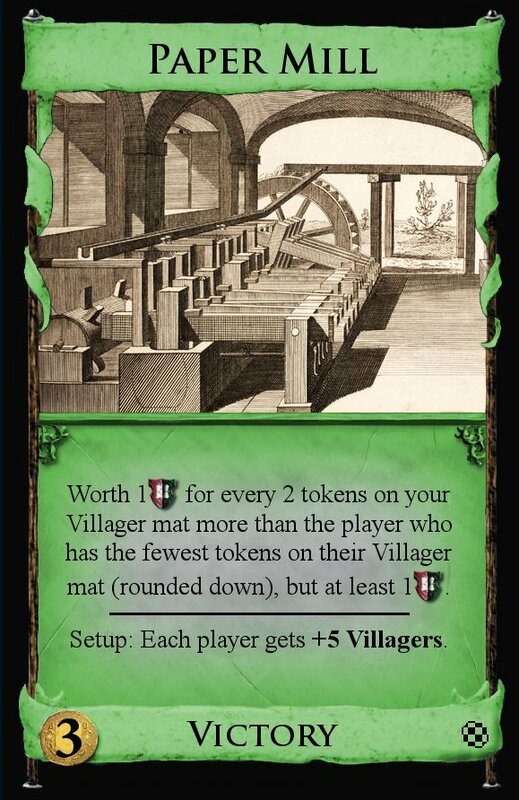 At the end of the game, if you have any tokens on your Coffers mat, this is worth 1VP, and if you have any tokens on your Villagers mat, this is worth 1VP (If you have both, this is worth 2VP). EDIT: Changed from “reveal and discard your hand” to “discard any number of cards, revealed”. 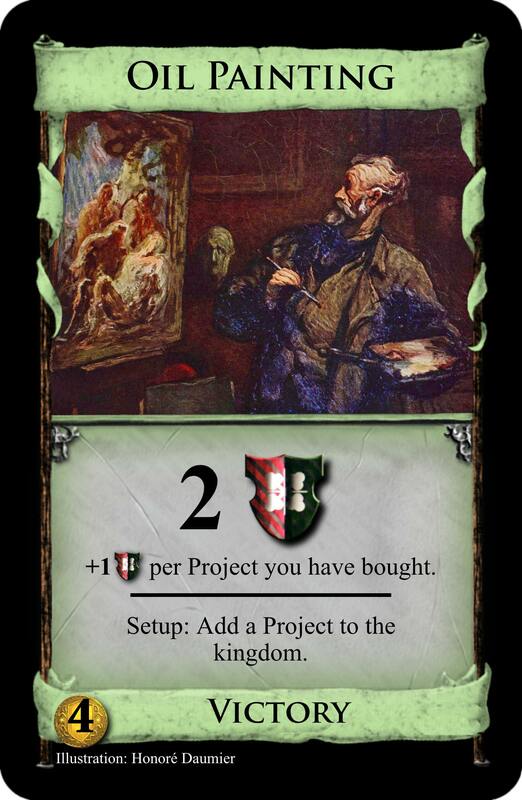 Oil Painting would be more interesting if it rewarded you for not getting Projects. Hah, I see what you mean. I think in general I find the tension of "There are two things I want to do, and I can only do one of them" to be less fun than the tension of "There are two things I want to do, and if I do one of them first then doing the second is easier but I might have missed the chance to do it", but YMMV.